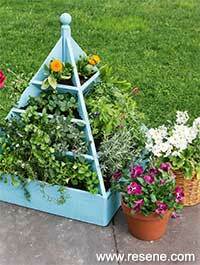 Build this pyramid planter and take your herbs high rise – they’ll be easier to pick and will add some interest to a dull corner, says Jane Wrigglesworth. You will need: nine 1.8m x 150mm x 19mm H3.2 fence palings, 300mm x 50mm x 50mm H3.2 pine for the top support, pack of 100 8g x 40mm decking screws, one wooden curtain finial, saw, electric drill, clamps and one litre Resene Lumbersider in Resene Paradise. Cutting measurements: (from fence palings) four lengths at 760mm (for base) four lengths at 980mm (upright supports) four lengths at 600mm (shelves) four lengths at 440mm (shelves) four lengths at 285mm (shelves). On each 760mm length, cut a 45° bevel at each end. 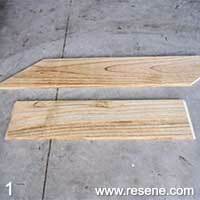 On each 980mm length, cut a 52° angle at one end. At the other end cut two angles – one at 52° and one at 38°. Place one upright support in between two base boards, as shown. 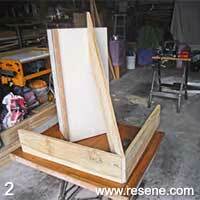 Use an old, sturdy wooden box or other object to hold up the support piece. 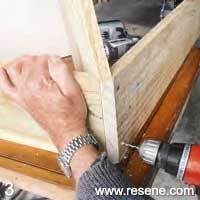 Drill pilot holes through the base boards into the upright support, then screw in place. 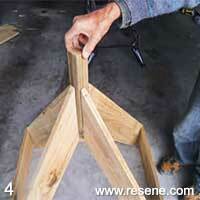 Repeat until all four upright supports are screwed in place. Position the 300mm top support in between the upright supports. Drill pilot holes through upright supports into top support and screw in place. Make the shelves. 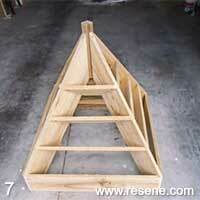 At each end of all 12 shelves, cut an angle of 32°. 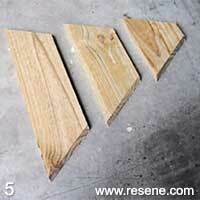 Then cut a 34° bevel on each end (as shown). Attach shelves to tower. Mark a line 180mm up from the top of the base board. Mark another line 180mm up from that, and another 180mm up. 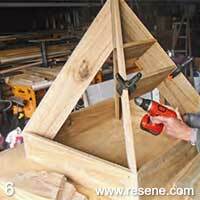 Position shelves and hold in place with clamps. Drill four pilot holes up from the bottom of each shelf into upright supports. Screw. The screw may poke out slightly on the other side, but it will be covered by the next shelf. 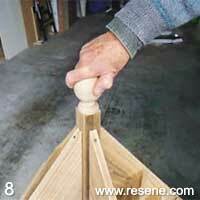 Mark the centre on the top support, then drill a hole to fit the screw on the finial. Screw the finial in place and paint. We used Resene Lumbersider in Resene Paradise.